The Zam Zam Foundation is a Social Services Organisation consisting of a cross section of Islamic scholars, professionals, businessmen, clergy and laymen. All of them are committed to help the needy in Sri Lanka, regardless of faith, ethnicity and regional backgrounds. The head office is based in Wellawatte, Colombo 6 while the Chairperson is Mufthi Yoosuff Haniffa. The Foundation is actively involved in educational development, community empowerment, healthcare, food provisions and nutrition, house building for poor and livelihood development projects in the remote villages and selected areas for the past nine years. The projects are targeted towards the deserving mass. Beneficiaries are selected purely on merit, ensuring that the most deserving are taken care of regardless of religion, ethnicity and social background. The foundation consists of 11 members along with the Chairperson. The Foundation has helped many families by providing dry rations through "Feed A Family" project preceding the holy month of Ramadan. They have also helped more than 5,600 school children by distributing school bags, shoes and stationery under the special project of "School with a smile." Speaking at the 'Zam Zam Family Night' program organised by the Zam Zam Foundation at the Excellency Grand Ballroom, Colombo recently, Chairperson Mufthi Yoosuff Haniffa said 'I am happy to be a part of Zam Zam Foundation and be of service to our motherland, Sri Lanka. I am thankful to all the donors, volunteers, well-wishers and colleagues who have joined us in making our projects and initiatives a success. Social work is an act of worship and the happiness and the satisfaction of the people is our happiness. As it is revealed in the holy Quran and as preached by Prophet Muhammed, every single person is a part of a big family where our common identity as human beings should come before we divide among ourselves on the basis of race, caste, colour, tribes and faith. Therefore, providing assistance and helping the needy is a universal responsibility as a human being and the essence of this message is in our foundation's slogan"Humanity Beyond Religion." "Poverty is an ocean and richness is an island. Similarly, the rich and poor need each other in various ways and each of us need to remember that we have a duty as human beings to help each other in our own capacities. It is important to every person and every generation to remember that as Sri Lankans of various faiths and ethnicities, the rich diversity of our country makes us stronger. We all have a duty as citizens to be responsible," he said. The Zam Zam Foundation has four main projects such as 'Feed a Family', 'Help a nest', 'School with a smile' and 'Healthy Society.' 'Feed a Family' is a project where essential food provisions worth Rs. 8,000 each pack is distributed during the month of Ramadan to the deserving families. It is distributed each year not only to the Muslim community but also to the poor and needy people of the other communities. 'Help a nest' is a project to assist in building houses for families who have no shelter. 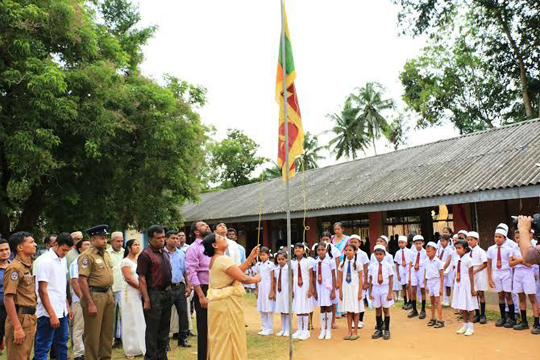 The Zam Zam Foundation has built 55 houses in Horowpothana, Nuwara Eliya and Hemmathagama. They have identified the requirement for more than 150 houses to build as per their 2015 project plan. These houses will be built for widows, people who were affected by the civil war and resettling now, orphans and the poor. 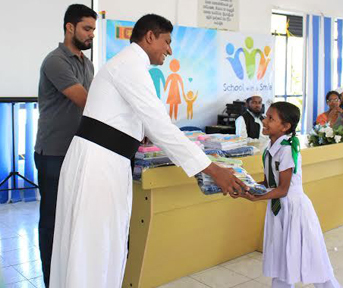 'School with a smile' is a project that helps underprivileged Sri Lankan students from all communities to be able to go to school with the support of well-wishers by reducing the burden on their families to take care of the costs related to education. 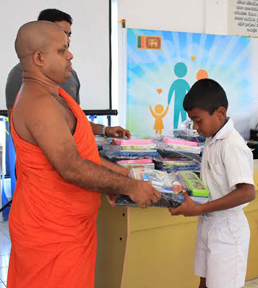 Each year a pack worth of Rs.3,000 is distributed to students containing items such as DSI, Trendy Bags, Maliban Traders, Nalaka Exercise Books and Ceylon Pencil Corporation (Atlas Stationers). 'Healthy Society' aims to develop and create awareness in fields of education, empowerment, spiritual and health. The Foundation is working on this project and it trying to implement it in the next three years. Rizwan Seedin, Project Manager of the Zam Zam Foundation said that when they plan on a project, they invite all the religious heads, discuss and decide to whom and where help should be provided. 'We recently constructed a library building for Shanthipura Vidyalaya in Nuwara Eliya and toilet facilities for Ambewela Maha Vidyalaya. We do teacher training sessions for all mediums such as Tamil, Sinhala and English. The Foundation always tries to create unity and harmony among the different religious groups. We work on the theme one country, one nation,' he said. Seedin said that at present they are working on a water project in Horowpathana - Nagollagama areas where there are no pure drinking water facilities. 'Most of the villagers in these areas are suffering from kidney problems due to the polluted water. There is only one well for both villages which has a population of 200 families. There was no electricity to pump water from the well to the tank. Fortunately as there is electricity now, we are going to fix motors for them to easily get water from the well to their homes. We are spending approximately one million rupees for the project. We get donations and funds to carry out our projects successfully from all the communities in Sri Lanka. We do not get foreign aid, but we get funds from Sri Lankans who live abroad as well,' he said.